See the natural wonders that line the Historic Columbia River Highway on this day trip from Portland to Mt Hood. With a guide, you'll be whisked to some of Oregon’s most spectacular sights, including Multnomah Falls and the Columbia River Gorge, as you learn about the area along the way. Stop by attractions like Timberline Lodge and Rowena Crest, and have free time for lunch in Hood River. Your day of exploring some of Oregon’s most famous natural attractions starts with hotel pickup in Portland. Then head out of the city to the Multnomah Falls, the second tallest waterfalls in the United States! As you relax in your tour vehicle, enjoy the natural beauty while knowing it's just a taste of what's to come, starting with your first stop at Multnomah Falls, the most famous waterfall in Oregon. The second-highest year-round waterfall in the United States, iconic Multnomah Falls is fed by Larch Mountain’s underground springs. Continue east along the highway to Hood River, a quaint valley town located at the confluence of the Columbia and Hood rivers on the Columbia River Gorge. Listen as your guide talks about the town’s environmental and cultural history, and hear about the kiteboarders and windsurfers who skim across the waters of the gorge, one of the county's top stops for these two wind sports. When you arrive in town, you have free time for lunch on your own. Pick one of the many restaurants to grab a bite, and then peruse the shops and wine-tasting rooms, if you wish (own expense). 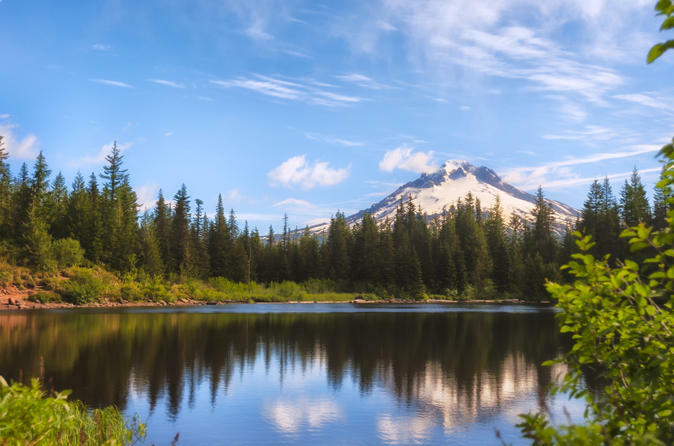 Back with your guide, return to your tour vehicle and visit Rowena Crest, a farm stand (seasonally), Trillium Lake (seasonally), and Timberline Lodge, positioned at an elevation of 11,249 feet (3,429 meters) on Mt Hood, Oregon’s tallest peak. Hop out to tour the lodge or take a short walk around the lodge to enjoy its mountain scenery. Your day trip ends with the drive back to Portland, returning to the city for hotel drop-off.